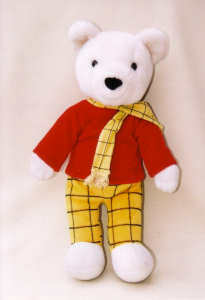 Rupert is a bear most people recognise on sight – his red jersey, yellow checked trousers and matching scarf are unmistakable. Yet, when he was originally drawn, Rupert wore a blue jersey – and those bright yellow trousers were grey! A lady called Mary Tourtel was the creator of Rupert, and her first cartoon strip appeared in the Daily Express on the 8th November 1920. The little bear, in many ways similar to today’s character though a bit more ‘bear-like’, and with baggier trousers, was shown setting out to the shops in the village of Nutwood. The caption was in verse. Mary designed many of Rupert’s chums, too, including Bill Badger, Podgy Pig and Edward Trunk and dreamt up the strange, almost surreal world of Nutwood which featured people in medieval dress wandering amongst a mix of incongruities such as clothed animals (who often kept unclothed animals as pets), ‘normal’ humans, and weird scientific inventions. Mary was fond of using magic to whisk her bear hero away from trouble; her successor, the much-respected Alfred Bestall who took over in 1935, relied on proper twists in the plot. He also introduced a host of new characters, such as Pong-Ping, Bingo Pup, the Professor, Merboy and Tigerlily. Alfred drew the stories up till 1965, and his last adventure was ‘Rupert and the Winkybickies’, though he continued to work on the annuals. In 1973, he was upset when a white Rupert was featured on the cover, rather than the traditional brown. Alfred had planned his beautiful painting around a brown bear, and felt there was no contrast between the white Rupert and the pale sky behind him. He was also aware that, artistically, there should have been a shadow on Rupert’s face. To appease the artist, a handful of annuals from that year were printed with a brown Rupert, and today, to discover a 1973 annual with a brown-faced Rupert is a collector’s dream. Over the years, Rupert has appeared in many guises, from glove puppets to slippers, and from lamp-shades to ceramics. His red and yellow clothes are bright and cheerful, lending themselves well to all kinds of medium. Probably, though, the most popular Ruperts of all, apart from the books, are the soft toys which are not only ideal as teddy comforters for small children, but lend themselves equally well to a more decorative role in a teen bedroom. Manufacturers of plush Ruperts have included Merrythought, Golden Bear, Chad Valley, Burbank, Hasbro and Pedigree – but the designing of the bears has caused makers a headache. For instance, should the fur be white or brown? 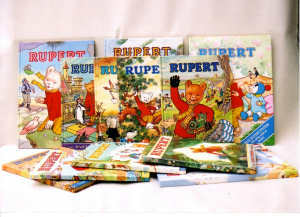 After all, most of the covers of the Rupert annuals depict a brown bear – but the illustrations inside depict him as white, which is confusing for youngsters, and must be baffling for the bear himself. Furthermore, does Rupert have paws or hands? Everyone knows that bears normally have paws but the cartoon strips show him with human hands. However when these are given to a plush toy, the result is very strange. 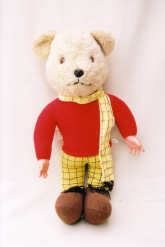 Burbank made a pull-string talking Rupert in the 1970s, giving him a brown furry face and pink dolly hands. The result, to say the least, is disconcerting, yet this substantial bear, who stands twenty-one inches high, is sought after by today’s collectors. Much more conventional was the limited edition Rupert made by Merrythought. These super, white plush bears with proper paws – not hands! – were beautifully dressed in the usual red jumper, yellow trousers with black checks and matching scarf, and complete with white lace-up shoes. They came in two sizes, eighteen inches or nine inches tall, and the smaller one was packaged in a sturdy, colourful gift-box. Rupert’s best friend, Bill Badger, was also available. 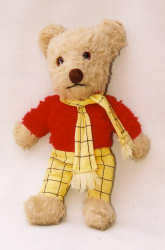 Golden Bear brought out a line of Ruperts in 1996, of similar size to the Merrythought bears. They also made a small puppet version which could walk (or dance, run, skip or turn somersaults) when two fingers were inserted into the legs. Burbank produced traditional-look Ruperts in the 1970s, as well as their ‘doll hands’ line. Their eleven inch tall model had a bean-type filling in the body, rather than just nylon stuffing, which enabled it to sit properly. Like all Burbank toys, it was very well made. 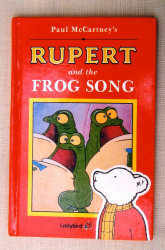 Pop star and ex-Beatle Paul McCartney gave Rupert a fresh lease of life when he wrote the song ‘We All Stand Together’ for an animated cartoon based on the froggy design of the end papers in a 1958 Rupert annual. This song was a hit in 1984 and the video ‘Rupert and the Frog Song’ won a BAFTA award. 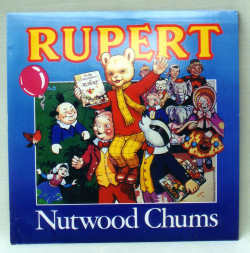 Many Rupert Bear records, cds and cassettes have been released over the years – in 1986 the Daily Express issued ‘Rupert Bear’s First Album Of Songs’, an LP by the ‘Nutwood Chums’ which featured 17 songs plus a story about Rupert, his friends, and their favourite places Nutwood and Rocky Bay. The colourful cover by John Harrold (based on his design for the 50th Rupert Annual) make this a must for any Rupert Collection – the reverse features 18 Rupert illustrations, mostly by Alfred Bestall. Rupert Annuals, of course, are widely collected and the earliest are eagerly sought after, especially those in mint condition, complete with dust jackets. Rarest of all is the 1973 annual with the brown-faced Rupert on the cover, but if you have a 1936 (very first) annual or an early wartime copy – in mint condition – you might have a small nestegg. The Daily Express issued a series of facsimile annuals of the 1930s titles, and now Pedigree is continuing the idea. The early Mary Tourtel books are also highly collectable; many of them sell for hundreds of pounds. Rupert is still going strong – he appears every day in the Daily Express. Other Rupert collectables include various games, jigsaws and Lledo diecast vans. In the 1970s Pelham made a super string puppet, while the Bendy Toys’ rubber Rupert could be posed in various ways. There are many badges and brooches; the Daily Express offered an enamelled pin to celebrate Rupert’s 80th birthday, and he has also supported police charities – on their badges he wore a policeman’s helmet! 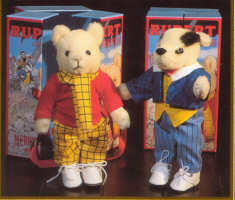 Several years ago Camtrak issued Wade Rupert figurines in their Childhood Favourites series, while a set featuring Rupert and several of his chums was produced by Beswick in the 1980s. Royal Doulton have a colourful collection of Rupert and friends, while Wedgwood’s series of Rupert plates, mugs, clocks and eggcups are sought after. An excellent Rupert ceramic collection could be formed with products from various manufactures, though it could prove costly because prices of Rupert ceramics are rising. Perhaps the nicest thing of all about Rupert collectables is that they are so colourful. How could they not be, when the star wears scarlet and bright yellow? Rupert’s timeless appeal – most people think of him as an adventurous good-natured small boy with a furry head – endears him to all ages. He is a British institution – and a super subject to collect.